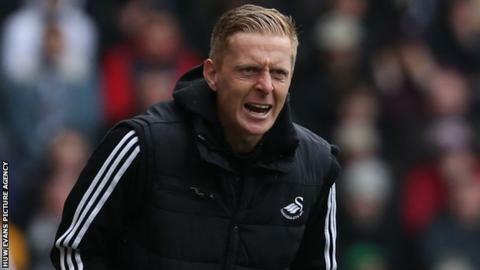 Chairman Huw Jenkins is confident manager Garry Monk will have no problem in attracting new players to Swansea City during the summer. Former club captain Monk was confirmed manager on a three-year deal following a spell in interim charge. Some have questioned if the rookie boss has the contacts to attract top players but Jenkins does not share those concerns. "We've developed a good stature about the club," Jenkins said. "We've got some respect around not only in our country, but Europe. "People know how we play. We've got a philosophy and an identity and we've got a lot of players and players' agents who want to come and play for us. "And I think that's a complete change to how the recruitment was dealt with years ago. "That's the big, big change. The focus nowadays is a lot on the club because of how things are. "So, yeah we've got a lot of interested players and agents continually on the phone and we are working towards making sure that's right for us." Monk's first game in full-time charge will be Sunday's final game of the Premier League season at Sunderland. The 35-year-old was placed in temporary charge of Swansea following Michael Laudrup's sacking and he guided the club to Premier League safety with two games to spare. Jenkins believes that people underestimated former Southampton defender Monk as manager when he took over from Laudrup in early Februrary. "Like every decision we make, whatever manager you bring in is a gamble. You only have to look to other Premier League clubs to see what has gone on to see that 10 or so managers have changed," Jenkins said. "That argument is completely overshadowed by the fact every club needs, first and foremost, good people you can work with and people you think will take on the challenge, and I think as always at our club look to build their experience and improve things and set their mark. "The biggest qualities are commitment and a passion for the job and working for Swansea City with the way we want to work. He (Monk) has got the thirst to learn and grow in experience. "The other side is every young manager in his position will make mistakes, like experienced managers do. !You just hope while he's learning we still carry on and achieve success. That is all you can hope for. "He has got ideas and thoughts of how he would like to implement some of the way we work in the backroom staff like other managers have, and I can see that growing as he gains in confidence as he goes along."